ApartmentFinder.com has been providing information about available apartments in every part of the United States since 1981. They’ve won multiple awards, including the Best Internet Listing Service from Multi-House News for three years in a row. The StatisFacts Index named them the Number One Apartment Search Source for two years in a row, and they’ve been nominated for, or awarded, similar honors by many other organizations. They are by far one of the largest apartment hunting resources on the Internet. ApartmentFinder is now a part of the CoStar Group, which has been connecting individuals to commercial real estate information and analytics since 1987. Together, the experience of both ApartmentFinder and CoStar have made this website a highly trusted source for rental information. One of the big positives of ApartmentFinder is the easy and extensive search function. Users start by narrowing their search down to a specific city or zip code; then filter by bedrooms and price range. These are the three typical options that show up on most apartment hunting websites, but ApartmentFinder takes it even further. You can search by a long list of amenities, such as parking, swimming pools, laundry facilities, fireplaces, wheelchair accessible, and gated. You can choose from apartments that allow dogs, cats, or both. You can narrow it down to apartments that are set up for income restricted or senior citizen renters, or for short-term or student renters. You can search by a range of square footage, and by a 5-star rating rubric, which is graded based on information gathered by the CoStar examination of every apartment community that is listed on the site. After narrowing your options down as much as you like, you’re presented with a list of apartments that includes plenty of images and information. Communities are given walk scores and transit scores, you can see how close airports and schools are, and many of the listings also include a break down of fees for pets or parking. If a building has more than one type of unit available, it’s easy to click on a simple tab that will show you the difference in price and amenities for a smaller or larger unit. Prices for units are only listed in ranges, rather than specific prices, so users will have to call each property to get the final cost before they know for sure if they can afford a specific unit. However, near the bottom of every rental listing, ApartmentFinder shows a list of nearby apartments, so users can easily compare the local price ranges, to see their options at a glance. For renters, ApartmentFinder is a one-stop shop that will help them narrow down from start to finish, this website is one of the best options out there. 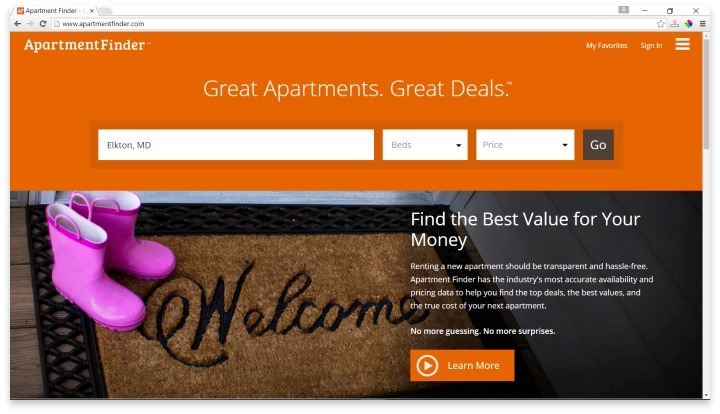 Overall, ApartmentFinder is one of the most useful apartment hunting resources on the Internet, and at a price of free, it’s impossible to find any con that would be a complete deal breaker. For renters who want a one-stop shop that will help them narrow down from start to finish, this website is one of the best options out there. The only thing you’ll be left to do is call for an exact price, but sticking to a range that’s well below your budget ensures that you won’t be too surprised by the final number. Have you had an experience with this company? Please share your ApartmentFinder reviews below.